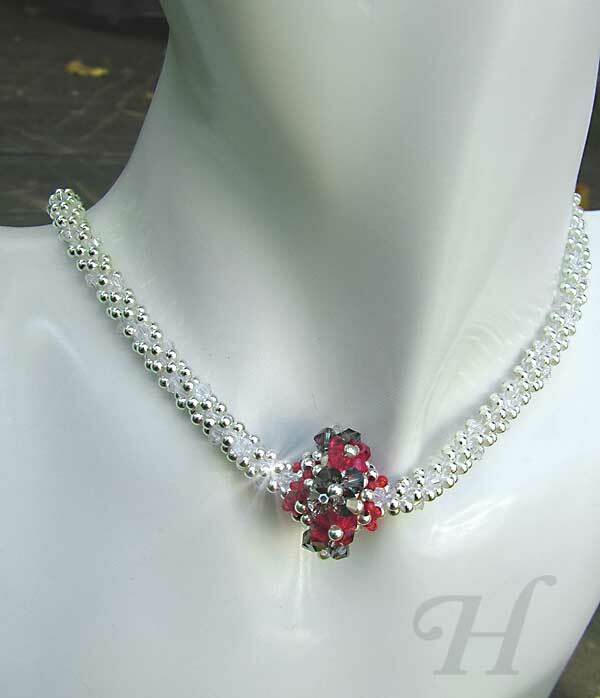 This beaded necklace is entitled "First Love" as a tribute to crochet which was my first love. Crochet has been with me through many years, many forms, and many obsessive moments. At times, I have abandoned it for not matching my current needs. But it always nudges me, no matter how many years of neglect has passed, and it calls to me still. It has now once again returned to enthrall me with its versatility and its capability to create beautiful, contemporary looks. A perfectly balanced beaded necklace with a seemingly simple "chain" and a large, eye-catching focal. 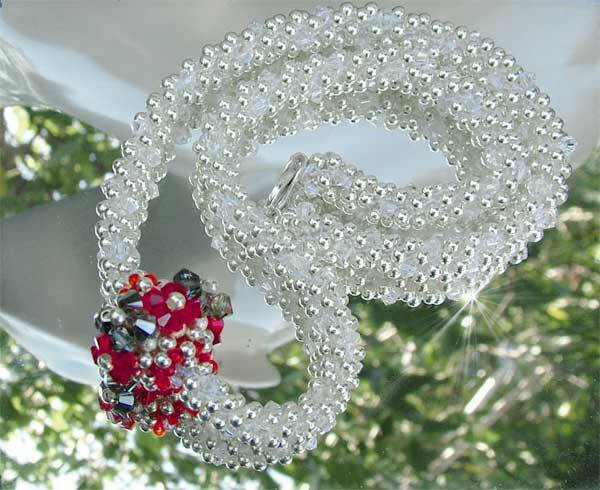 The "rope chain" is crocheted; an intermix of bright silver metal beads with embedded small Swarovski crystals (#5328, Clear Crystal, 3mm). 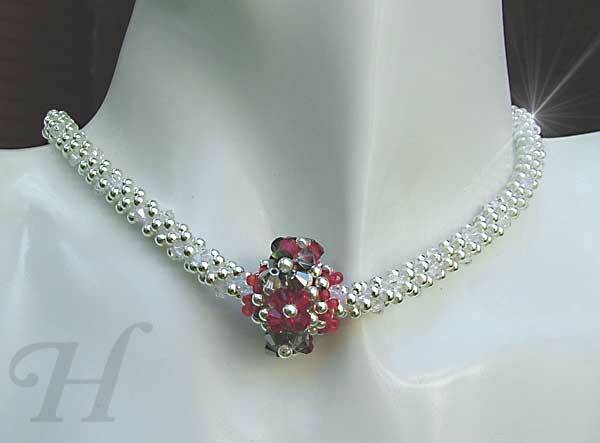 The embedded crystals provide unending flashes of sparkle all through the necklace. The handmade focal bead is not attached to the necklace - it can move along it. However it is a close fit so that, though it can move along the necklace, it is snug enough to remain in one place during wear. Conceivably, you can move it into an asymmetrical position and it will stay in place. Here below is another photo showing the full completed piece. 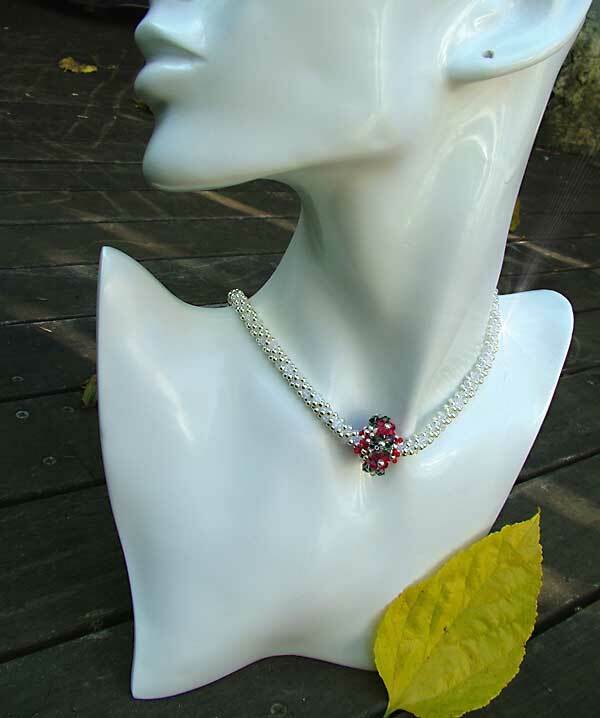 The beaded necklace is finished off securely with an "eternity" lobster clasp (aka "parrot clasp" - 0.925 Sterling Silver. Some of these WIP (work in progress) photos are a bit crappy. Taken late at night with shaky hands on a mobile phone - which is definitely not suitable for close up product shots. But it will still provide enough visual clues to how the beaded piece is accomplished. Preparation - showing the sequence of beads. All the beads have to be strung before the crochet can begin. For this crochet beaded rope, I decided on 3 beads per row, and about 204 rows ==> 612 beads in total. 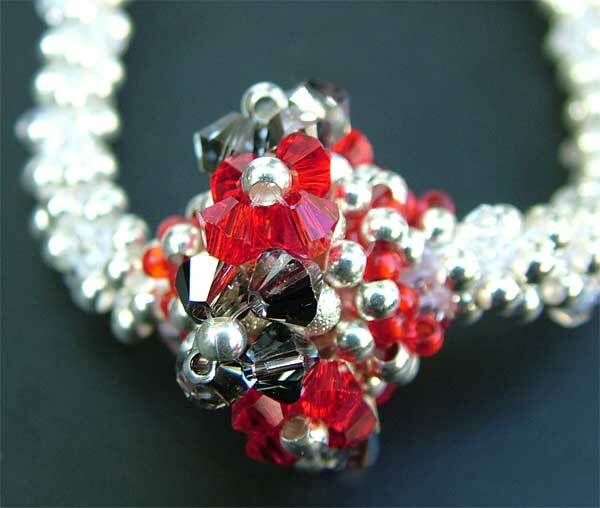 So working it all out, there are 102 Swarovski bicones, and 510 metal beads. 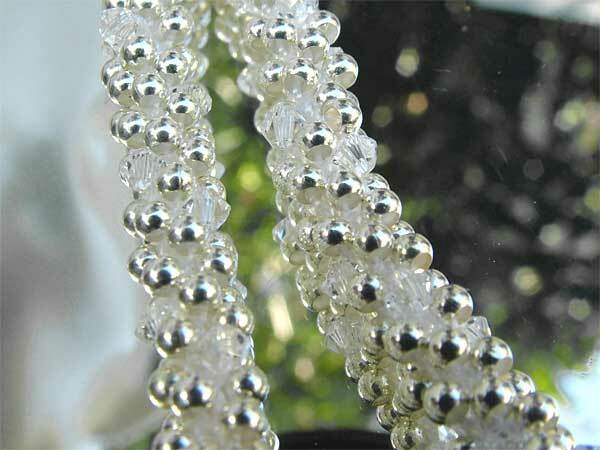 It is always better to over-estimate and string more beads than what you might end up needing. Your final length is determined as you work and measure it. You don't want to have to break off your crochet thread to string more beads in the middle of your work if you can help it. Always have an extra fine crochet hook nearby. I use Clover #12 (0.6mm). This much smaller hook is a life-saver. If you should drop a stitch while doing the crochet, it is virtually impossible to grab the dropped stitch using the main hook. You need a much finer one handy which will be able to pick up that dropped stitch. Otherwise you might find yourself un-raveling all the way back to the start! Not fun. A close up of the beaded crochet rope. Though it might not have seemed to have been an intuitive choice to pick white as the crochet thread, you can see that the string virtually "disappears" into the piece. Exactly what you want for your crochet beaded necklace. Sorry, a blurry pic to be sure! This is the base of the focal bead. It is worked in RAW (right angle weave). I used a double-sided (like double-needle but without the needles) approach and 6lb invisible nylon thread. 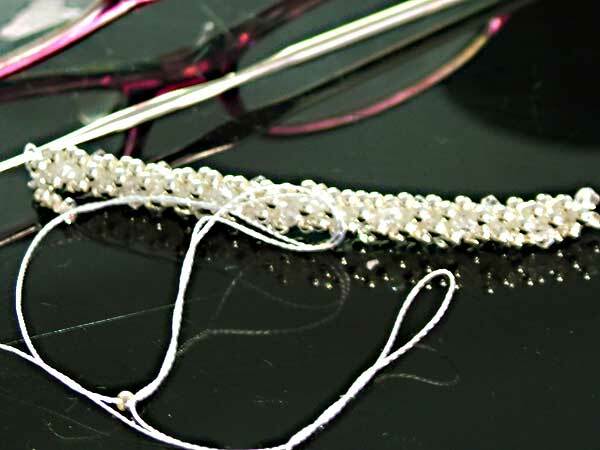 Make sure to start off with a fairly long thread - enough to do the base and the overlay of beads to form the focal bead. 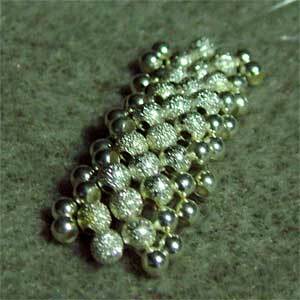 Start off with the center row - which is 3mm Stardust silver beads. You want to make the length long enough so that you can have alternating overlay colored beads ("flowers") on top and long enough to go round the crochet rope of your beaded necklace. Keep in mind you will have 1 more "row" of RAW to work to be able to join the ends to make a tube (bead) around the crochet rope. At this stage, you have 2 threads coming out of the end of your work. Thread on a needle for one of the threads and work in (using RAW) the shinny 2.5mm silver beads - on both edges. After that, weave in multiple times and with multiple half-hitches randomly along the way to finish off neatly and securely. Cut off that thread. At this stage, the piece is still flat as it will be much easier to work the overlay beads next. Next thread on the needle on the remaining thread and work the overlay flowers. 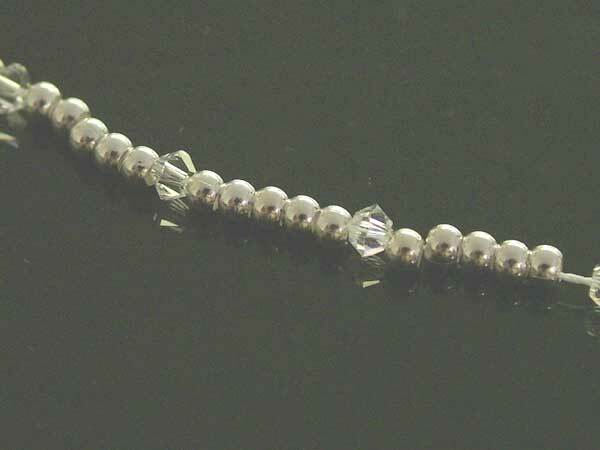 Here I used Light Siam and Crystal Silver Night (4mm) - each topped with a 2.5mm seamless silver metal bead. At the end of this, join the ends so that it forms a tube around the crochet rope. Finish off the last overlay "flower". If you have not done so already, thread on this tube bead onto your beaded crochet rope. Note that the focal bead has a red edging. This is for the color as well as to tighten the hole-edges of the focal bead. I have done this in 2 rows with 11/0 seed beads. 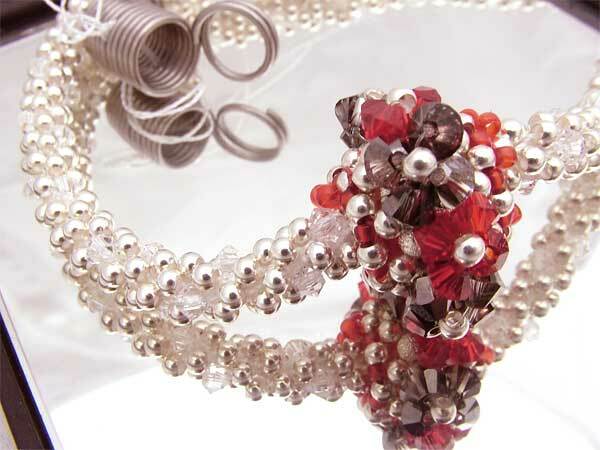 Row 1: sew each red seed bead in-between 2 silver metal beads, tightening the bead-hole as you go. You want it tight and snug around the crochet rope, but not too tight that it will not move. 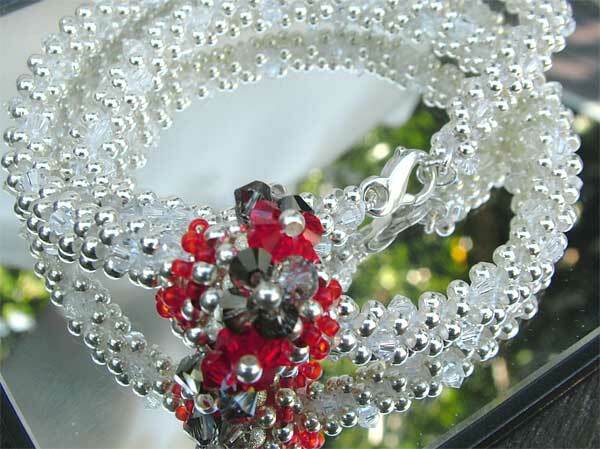 Make sure, as you sew on the red seed beads that you do not sew the focal bead onto the crochet rope. Row 2: Sew on another row of red seed beads - this time between the previous row's red seed beads. Tighten appropriately as you go. 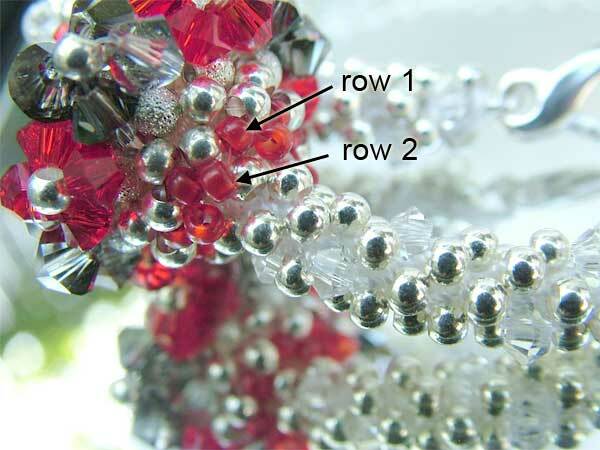 This gives another row of stability to the hole-edge of the focal beaded bead. You do not add the clasp till the focal bead is all done. This is just in case the focal bead will not fit over the clasp you choose for your crochet beaded necklace. For the clasp on this crochet beaded necklace, I have chosen an "eternity" Sterling Silver lobster clasp. It is elegant and unobtrusive and it is secure. I have used the threads from the ends of each side of the crochet rope to secure the clasp in place and to ensure that it is a smooth transition from crochet rope to clasp. I used Sterling Silver bullion (or "gimp") which gives it a much more finished look (instead of having threads showing around the loop of the clasp) and which also provides protection for the thread from friction. 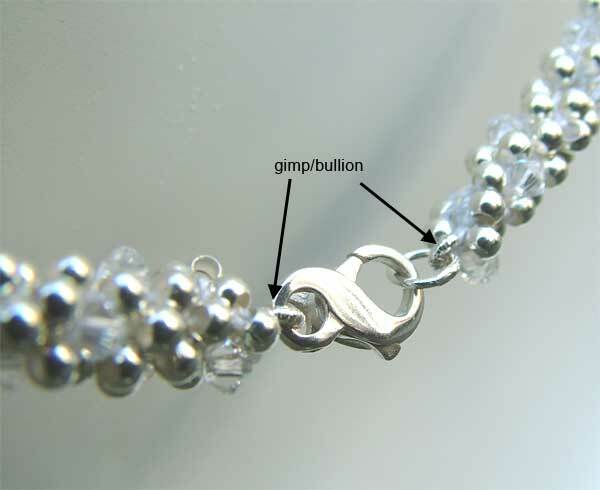 As securely as possible, the bullion has been "merged" back into the crochet rope and the thread is woven in multiple times, multiple directions, with random half-hitches before cutting off.